The second letter of Peter is written “to those who through the righteousness of our God and Savior Jesus Christ have received a faith as precious as ours” (verse 1). This could apply to Christians anywhere, so Peter’s letter is called a general epistle (sometimes called a catholic epistle, after the Greek word katholikos, meaning general), because it was not written to a specific church. We are familiar with Paul’s teaching that we receive righteousness by faith in Christ. Peter has turned this around to say that we receive faith through the righteousness of Christ. Because Christ is good, he has made it possible for us to have the faith that we need to accept him. We have a relationship with God only because of his mercy. Peter then greets the readers: “Grace and peace be yours in abundance through the knowledge of God and of Jesus our Lord” (verse 2). Peace comes from knowing God, as he is revealed to us in Jesus. Peter begins the next verse by saying, “His divine power has given us everything we need for a godly life.” All of salvation is a gift, through knowing Christ —“ through our knowledge of him who called us by his own glory and goodness” (verse 3). Through God’s glory and goodness, Peter says, “he has given us his very great and precious promises, so that through them you may participate in the divine nature, having escaped the corruption in the world caused by evil desires” (verse 4). The gift of salvation not only shows the goodness of God, it also shows his glory — it shows that he is worthy of worship. What aspects of the divine nature may we participate in? Love, joy, peace, goodness, holiness and eternal life. Salvation involves not just future life, but also power in the present to escape the sinful desires that used to control us. This self-control is not a requirement for salvation, but a benefit of salvation. In Christ we are freed from sin so we can walk in his righteousness. Since God has given us his power, Peter advises us to “make every effort to add to your faith goodness; and to goodness, knowledge; and to knowledge, self-control; and to self-control, perseverance; and to perseverance, godliness; and to godliness, mutual affection; and to mutual affection, love” (verses 5-7). These do not necessarily come in this sequence, of course — we grow in all of these areas at the same time without ever reaching perfection in any. Then Peter gives us this promise: “For if you possess these qualities in increasing measure, they will keep you from being ineffective and unproductive in your knowledge of our Lord Jesus Christ” (verse 8). Yes, if we are growing spiritually, the knowledge that God gives us will not go to waste. He teaches us and strengthens us so that it will make a difference in our lives. “But whoever does not have them is nearsighted and blind, forgetting that they have been cleansed from their past sins” (verse 9). If we aren’t trying to improve, then we will be unproductive. The knowledge of God’s grace and mercy should cause us to want spiritual growth and to want to please the one who saves us. Since God has saved us and given us spiritual strength, Peter exhorts us: “Make every effort to confirm your calling and election. For if you do these things, you will never stumble, and you will receive a rich welcome into the eternal kingdom of our Lord and Savior Jesus Christ” (verses 10-11). Peter does not say what will happen if we fail — he simply exhorts us to be diligent. Our effort will be richly rewarded. Peter knows our weaknesses and the need for frequent reminders. Yet, he does not want his exhortation to come across as an insult, so he comments: “I will always remind you of these things, even though you know them and are firmly established in the truth you now have. I think it is right to refresh your memory as long as I live in the tent of this body” (verses 12-13). Paul also uses the metaphor of a tent as a body (2 Corinthians 5:110); the idea is that a person’s physical body is a temporary housing for a spiritual life. The body will be resurrected (1 Corinthians 15) and God will give us an eternal home (1 Corinthians 15:53; 2 Corinthians 5:1). Peter doesn’t tell us as much as we’d like to know on this topic (nor does Paul), because he has a different purpose: exhorting Christian growth. He uses the metaphor of tent to describe his own death: “I know that I will soon put it [the tent] aside, as our Lord Jesus Christ has made clear to me. And I will make every effort to see that after my departure you will always be able to remember these things” (2 Peter 1:14-15). As Peter sees that his time of departure draws near (tradition says that Nero had him killed in A.D. 64), he puts his exhortations into writing so that we will have a regular reminder that our Savior wants us to continue to grow. The Transfiguration shows that Jesus had divine glory even before his resurrection; and the glory that Peter saw then made it easier for him to understand and believe Jesus when he promised to return in power and glory. Peter also reminds the readers of his basis of authority: “For we did not follow cleverly devised stories when we told you about the coming of our Lord Jesus Christ in power, but we were eyewitnesses of his majesty” (verse 16). We didn’t just make up the stories in an elaborate hoax, he says. Nor are they myths (like Aesop’s fables) designed to teach truth through imaginative events. No, these things about Jesus really happened — we were there, and we saw it. 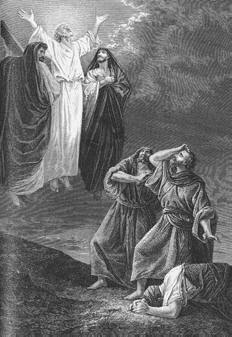 He then uses the Transfiguration as an example: “He [Jesus] received honor and glory from God the Father when the voice came to him from the Majestic Glory, saying, ‘This is my Son, whom I love; with him I am well pleased’ [Matthew 17:5]. We ourselves heard this voice that came from heaven when we were with him on the sacred mountain” (2 Peter 1:17-18). Out of all the stories that Peter could have told, why did he pick the Transfiguration, rather than the resurrection or ascension? Perhaps this was the most eye-opening event for Peter — when he heard a distinct voice from God himself. The Transfiguration shows that Jesus had divine glory even before his resurrection; and the glory that Peter saw then made it easier for him to understand and believe Jesus when he promised to return in power and glory. Peter seems to refer to the Second Coming in the next verses, too: “We also have the prophetic message as something completely reliable, and you will do well to pay attention to it, as to a light shining in a dark place, until the day dawns and the morning star rises in your hearts” (verse 19). Peter points us to the Old Testament prophecies of the Day of the Lord, and we need to live with the knowledge that the day of reward will come. The prophecies are trustworthy not just because we have seen many of them fulfilled — they are reliable because God caused them to be written. “Above all, you must understand that no prophecy of Scripture came about by the prophet’s own interpretation of things. For prophecy never had its origin in the human will, but prophets, though human, spoke from God as they were carried along by the Holy Spirit” (verses 20-21). The prophets did not make up their stories, either, and they didn’t always understand how the predictions would be fulfilled. But the prophecies came from God as the Holy Spirit caused them to be written. This does not mean that God dictated the exact spelling of every word, or the precise choice of every word. But the meaning came from God, and the message can be trusted. Do my imperfections make me try harder, or make me quit trying?